The Armada is coming. An Armada of aliens that is – from a videogame, that main character Zack Lightman and his friends play nightly. Has Zack gone insane? 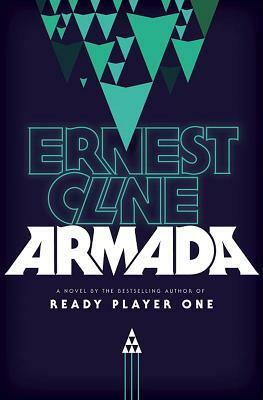 This is how Ernest Cline’s second novel, Armada begins as we delve into the very confused and tormented mind of eighteen-year-old Zack Lightman. The high school senior, like many high school seniors, is entirely unsure of what he wants to do with his future, and knows only what he loves. In Zack’s case, this is playing videogames, particularly Armada. In Armada Zack fights, along with his friends online, to save Earth from the Sobrukai, an alien clan of octopus-like creatures yearning to take over Earth and extinguish humanity. When Zack looks out of the window of his classroom and sees a ship that looks exactly like a Sobrukai ship from Armada, he begins to wonder if he is losing his mind, like he suspects his late father did. From here the plot unravels into an intricate conspiracy theory about the intention behind numerous science fiction films, books and videogames, luring the reader into the book with a hook that makes you question your own reality. The typical trope of “regular boy becomes hero” is what moves Armada forward, but Cline uses this trope in such a way that he imbues it with a fresh and unique aura. Though Zack’s story echoes so many other science fiction hero narratives, particularly that of Luke Skywalker, the setting and contemporary references make the plot so palpable that the reader can’t help but be drawn in. Cline is continually referencing not only popular videogames and science fiction characters that only the ultimate geek will pick up on, but he also weaves classic rock references into nearly every chapter calling out the old school rock nerds as well with his laugh out loud comments. There are also certain points where the plot seems overly contrived, but once you step back and realize that all novels are in fact contrived and there’s sometimes no way around bridging the gaps in a story except by making certain things happen that need to happen, you can move past this hiccup. Plus, Cline’s characters give such weight to Armada, that you can easily overlook these seemingly forced spots and keep going with fervor. Overall, Armada is by far one of the most engaging reads of 2015. The characters, plot, references and tone of Armada propel you into this near futuristic world with a gusto that results in absolute immersion. After the success of his first novel, Ready Player One, Cline has done it again, creating a fascinating world that seems so real, you will begin to question your own sanity. Released by Crown Publishing on July 14, 2015, Armada is available at your local bookstore.